How to Use the Foil. Never wave swords about not point a weapon at someone who is not wearing a mask. When holding a sword, keep the point down towards the floor. Do not run while holding a weapon by the handle. Always hold it by the point when walking or running. If you need two hands to don your mask put your foil down first. Make sure that your foil has a covering over the point and that the weapon is not broken or badly bent near the tip. Wear the proper clothing (mask, under plastron, jacket, glove, trainers and long trousers) and make sure your clothing is in good condition (no holes in jacket, bib fixed properly to mask, jacket fully done up at the collar, shoe laces not trailing on the ground). Make sure your opponent is also safe. Never lose your temper - it's only a game. Obey the Referee (President). Don't start fencing till s/he says "Play" and stop when s/he says "Halt". If you are fencing without a Referee, make sure you are both ready before starting. Never turn your back on your opponent. Remember there is a gap at the back between your mask and collar which is not protected. Don't run into your opponent or jostle him. Body contact is not allowed. Keep you non-sword hand out of the way. Holding the bib of your mask or bringing your hand in front of the target is not allowed. It is also extremely painful to be hit on unprotected fingers. Learn to make the hits firm but with a light touch. You are not trying to run your opponent through. 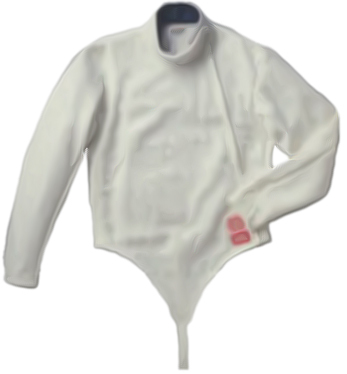 Fencing takes place on a specially marked out strip (the piste) and a bout, or fight, consists of two fencers , in combat, trying to score a set number of hits in order to win. Hits must be made with the point of the sword. The idea is to hit the opponent on the target without being hit. The first fencer to score the required number of hits (usually five) is the winner of the bout. There is a time limit for the fencing in each bout. At the front, the trunk excluding the arms, legs and head but including the V of the jacket covering the groin. 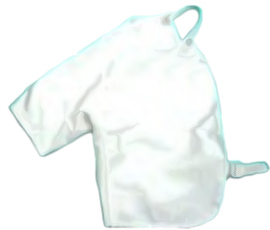 The bib of the mask is not part of the target. At the back, the target extends down a line joining the top of the hips. A fencing bout is governed by rules which are interpreted by a Referee or President assisted by four judges (unless electrical equipment is in use which records hits). Two judges watch each of the fencers. The President gives the orders ("Play" and "Halt"), says what fencing moves s/he saw take place and asks the judges whether a hit occurred. They may answer "Yes", "Yes but off target", "No" or " Abstain" (don't know). In deciding whether a hit occurred, each of the two judges has one vote and the President one and a half. Thus if both judges say "Yes" and the President thinks "No" his is outvoted and he has to award a hit. If one judge says "Yes", the other "Abstain" and the President says "No", there is not hit. The most important rule in fencing foil is that the attack must be made by extending and straightening the sword-arm so that the weapon threatens the target. (Remember the lunge starts with a straightening of the arm before the feet move). This gives the attacker the "right of way". The person attacked must then defend him/herself. He is not allowed just to simply hit back. The attacker loses the right of way if s/he bend his/her arm again, or if s/he stops threatening the target, or if his/her opponent parried or beats his blade so that it is no longer threatening the target. A bout should look like a backwards and forwards exchange of attacks and parries, not like two bulls charging at each other. Politeness in fencing is important. Before a bout or a lesson a fencer should salute his/her opponent (or coach) as well as the President and judges. 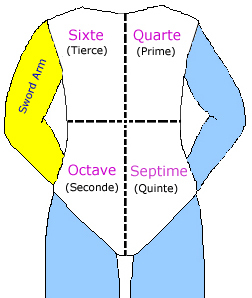 At the end of the lesson (or bout) the fencer should salute the opponent, remove his/her mask and place it under his sword-arm, and should shake hands with the opponent using the non-sword hand.